My lunch looks like summer, bright pink and yellow, a glowing sunset on the table! I got my Mediterranean plates out to make the holiday feeling complete. This is a quick salad, it doesn’t require many ingredients or much time. 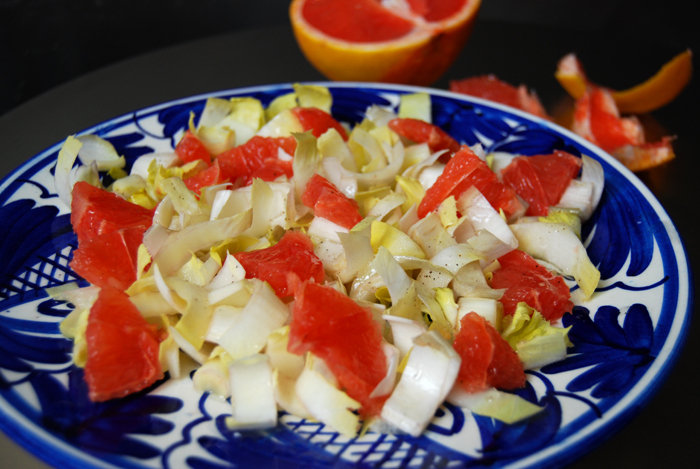 It’s a variation on my Chicory Pear and Walnut Salad, but this time I combine the crunchy chicory with the bitter sweetness of pink grapefruit. It’s lighter, more like spring. Full of vitamins, this mix refreshes the body and mind within seconds! 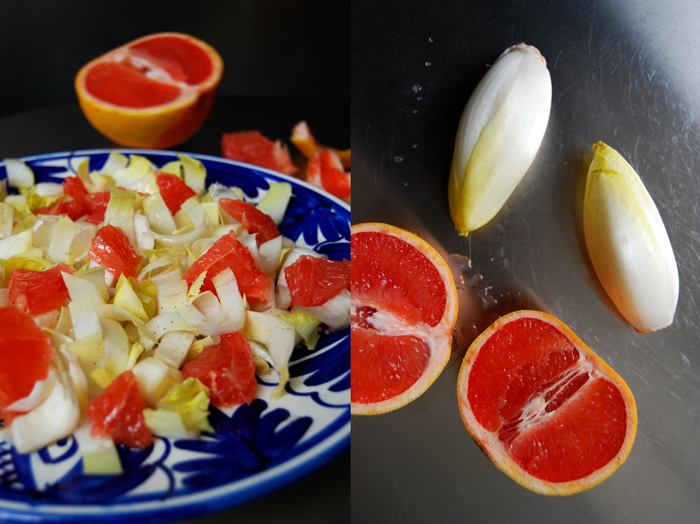 For a salad for 2 (as a side dish) I cut 2 chicories in half and then into thick slices. I mixed them with the juicy bite sized pieces of half a pink grapefruit, you can use more but I wanted more leaves than fruit on the plates. My dressing is also simple and quick to prepare, 3 small tablespoons of olive oil mixed with 2 small tablespoons of white Basamico vinegar, seasoned with salt and pepper. I drizzled it carefully over my salad, just enough to glaze the leaves and fruit. Too much of the dressing would cover the salad’s sweet bitterness with sourness, they have to keep a balance. 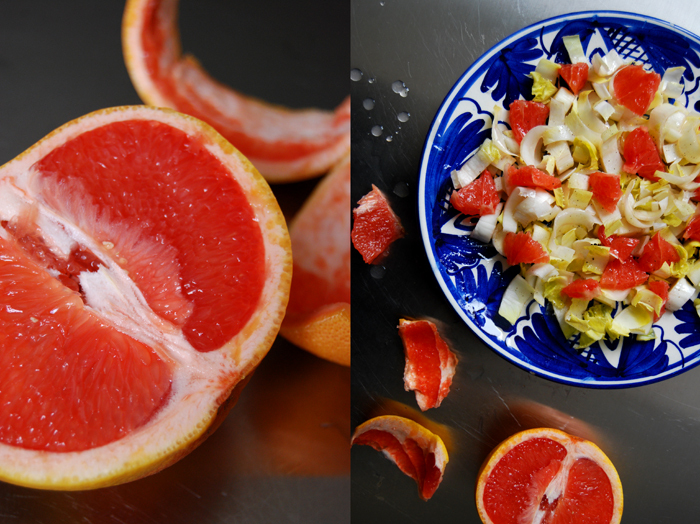 I love grapefruit in salads, it adds just enough sweetness and freshness. Great idea to pair it with Chicory! Thanks so much for stopping by my blog Meike, and liking my whole-wheat apple muffins, they are our family favorites this time of the year. I love morning muffins! I want to make yours soon, they look really yummy!